I can't buy Yamcha unless I buy them all. This is a problem. Would he be in scale with your collection? Juanjorman told me these are Figuarts size but I don't know for sure. Might be close enough. I'd be interested in the Yamcha, Tien, Chiaotzu, and DBSuper figures. 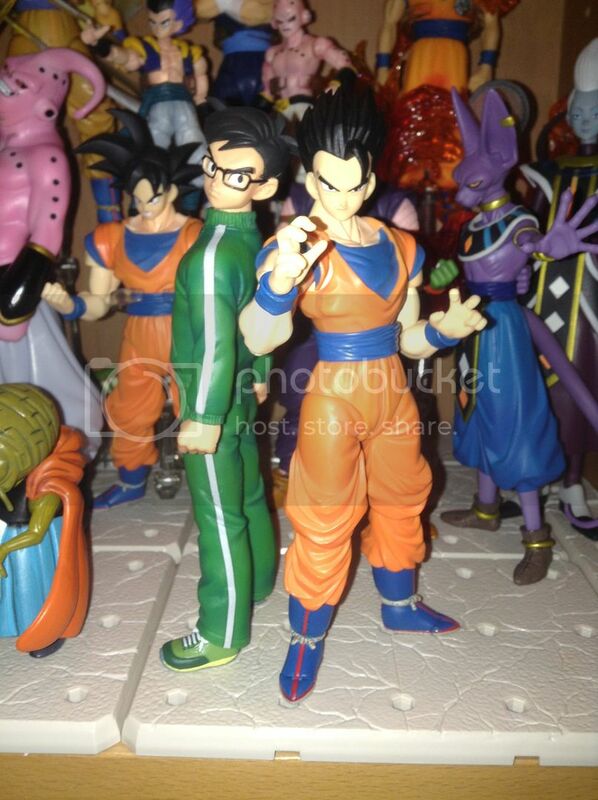 If I didn't have my custom Tien, I'd probably get that Tien for my Figuarts collection. He looks nice. I guess I'll probably get Chiaotzu. Looks like I'll be getting Tien, Yamcha, Chiaotzu, and Gohan. Might get that Trunks too depending if he's in scale with S.H. though I doubt it since Trunks is under scaled to begin with. I'll hold off on Champa since Tamashii may just decide to make him soon. The Super figures are a must for me! I love Goku & Vegeta's new look in revival of F & Champa is obviously going to play a big part later down the line, anybody have an idea of when they will be released? My wallet must be ready! Vegeta and Beerus on Feb 16, Goku and Champa on March 16. 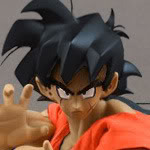 I think it's basically DXF SSG Goku re-issue with non-floating legs, under the name of the DBSuper series. Like it, but I keep my first version. I do not want the same twice, nor because of the small detail. This figure may have just gotten me hooked; it looks wonderful. Makes that SH Figuart look kind of bad. 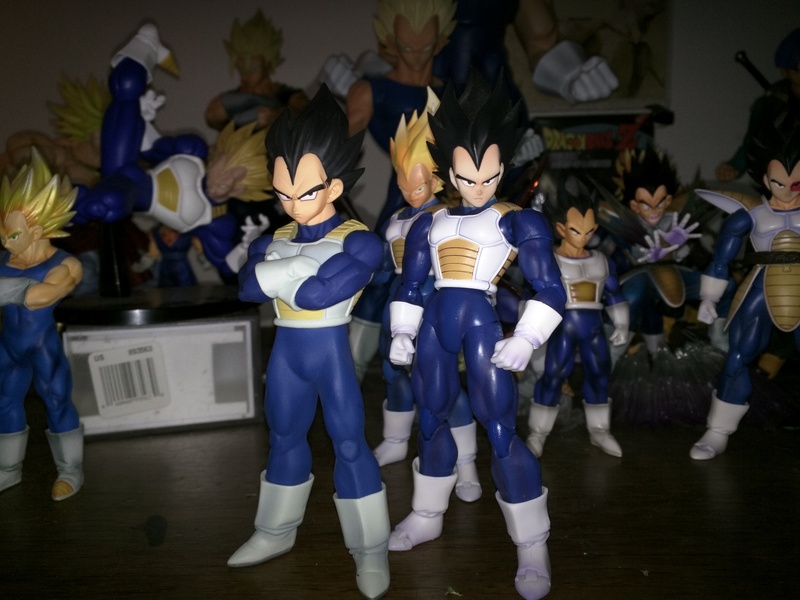 I just really wish the SS Vegeta in this line wasn't just a lazy repaint. It bothers me so much. The gesture, while Super Saiyan, should express power. This, while perfect for this form, is horrible for SS form; just like the HSCF Vegeta to the left. But at least the HSCF wasn't a simple repaint. But, with that gripe aside, this line is very accurate; the sculpts are amazing. I'm definitely getting Yamcha, Tien, Chiaotzu and especially Saiyan Saga Gohan. I also ordered Revival of F Gohan for $8.00. Super Cheap! *Anfroid SAGA Gohan. You can notice by his shoes, and by the fact that the whole Z fighters are in their Android Saga look. About the repaint thing for the SS, I agree with you, it's really annoying and the only thing that keeps me away from getting them. If they'll make more SS in the future that won't be just repaint/another head on the same body I'll get it for sure. I saw that too and had to order one myself. That was exactly it! Thanks dude! Looks perfectly in scale like most of these figures are.